SquawkLog Solutions, LLC | Aircraft Management Made Easy! With SquawkLog, you'll be able to track all of your squawks related to your aircraft. You'll be able to attach pictures or any supporting documentation related to the squawk by simply dragging the images into a folder. When ready, you can turn the squawk into a maintenance event. Scheduling and tracking all aspects of your aircraft is one of the centerpieces of Squawklog. You'll be able to contact your A&P or Service Center directly from Squawklog. As with Squawks, attaching images or any other document can be easily attached to the maintenance event. SquawkLog has a easy to use aircraft flight log. 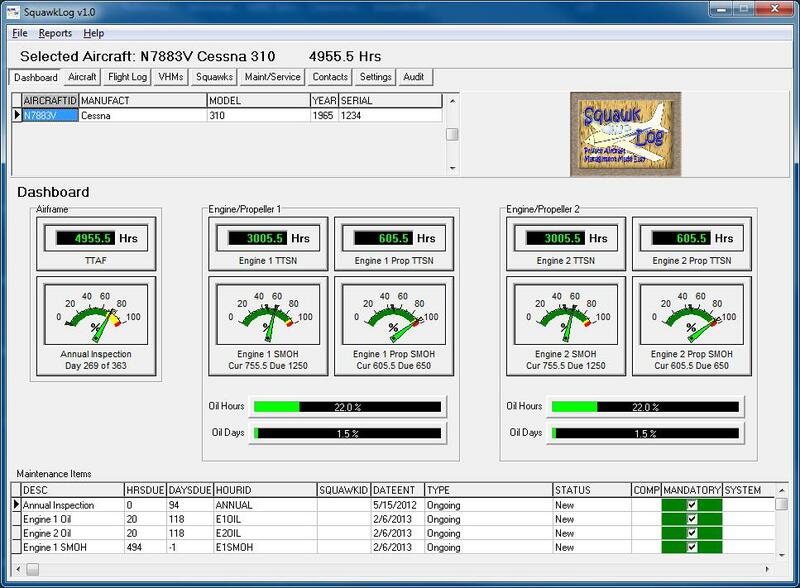 The aircraft flight log is tightly integrated with your aircraft tach/hopps hours meter. It automatically updates the hours based on your entry in the flight log. It also allows you to be able to create squawk if you had an issue while flying. One of the most powerful features of SquawkLog is your ability to create an infinite number of "Virtual Hours Meters" (VHM). VHM's can be created for virtually any component or system in your aircraft that you would like to track hours and/or days. Each VHM allows you to define rules on how you'd like to use each timer.